(10:31 a.m. EDT) -- Just two days after the trial of Costa Concordia captain Francesco Schettino opened, it was adjourned until September 23 for the Italian court system's summer break. After their request for a plea deal was rejected, the defense asked the judge to order tests on the ships' wreckage to determine why several systems failed when it struck a submerged rock January 13, 2012 off the coast of a small Italian island. The request sets the stage for the defense claiming no one actually died during the accident itself, according to the Associated Press. The defense will argue the deaths of 32 people occurred during the evacuation because the backup generator failed and water-tight compartments flooded. Had the backup generator not failed and elevators worked, one of Schettino's lawyers said, crew would have been able to use them to facilitate the evacuation of the 4,200 passengers and crew onboard. Schettino is the sole defendant in the trial, which is expected to last into next year and could see as many as 1,000 witnesses -- many of them survivors of the tragedy -- called to testify. 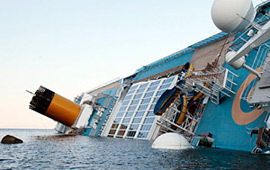 He is charged with the involuntary manslaughter of 32 people, causing a maritime disaster and causing personal injury to 150 people who were seriously hurt in the accident. He faces at least 20 years in prison if found guilty.